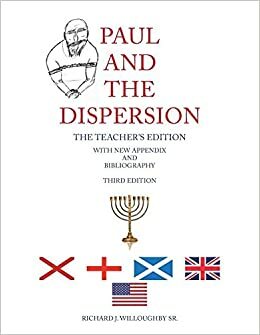 by Richard J. Willoughby Sr.
Paul and The Dispersion is for Bible students. Maps are provided for students to follow Paul’s journeys to foreign nations. By tracing his land and sea voyages, students will learn the reason why Paul carried Jesus’ name to those far off places. Students will discover exactly to whom Paul was sent by Jesus. For example, Paul also evangelized Jews in their synagogues. (Acts 9:20; 17:1,2; Romans 1:16) They were Jews who had scattered from Israel many years before and who are also known as The Dispersion. This is rarely or never emphasized by traditional teaching, a teaching that emphasizes Paul’s apostleship to Gentiles only. Students will find that there is overwhelming Biblical evidence that Paul was not solely an apostle to Gentiles but that he was also sent out to Jews who had scattered to foreign nations. Then, ask yourself this: Why would a non-Jew, Gentile, be expected to know or have an interest in a Jewish God’s Bible and follow Paul’s teaching? Jews of the Dispersion had scattered and worshipped in their Synagogues at Damascus, Salamis, Antioch of Pisidia, Iconium, Philippi, Thessalonica, Berea, Athens, Corinth, Ephesus. به دلیل این پست درخشان. کمی بیشتر در مورد این موضوع؟ من می توانم بسیار سپاسگزار باشم اگر بتوانید کمی بیشتر توضیح دهید. رفتن به بار دیگر از آنجایی که من آن را نشانه گذاری کردم. ثروتمند باشید و به دیگران کمک کنید. بله در نهایت چیزی درباره خصوصی است. من حدس می زنم که من آنچه را که من ارائه می دهم خلاصه می کنم. من کاملا از وبلاگ شما لذت می برم. من هم یک وبلاگ نویس مشتاق وبلاگ هستم، اما من هنوز برای همه چیز تازه هستم. I am really impressed along with your writing skills as neatly as with the format to your weblog.